holding any other event which will create greater interest in daffodils. This website is hosted by the American Daffodil Society for the Midwest Daffodil Society. Our thanks to them, and here's our request to you: check their website at DaffodilUSA.org. Then, consider joining the American Daffodil Society. Ask us a question or request a callback. We often meet at the Chicago Botanic Garden and our show and sale dates are usually posted on their calendar and here. The 2019 Spring Show will be held at the CBG on April 27-28, 2019 in Bernstein Hall at the Chicago Botanic Garden. The show results for last year are posted here. This year's show will be much the same and will follow similar rules and guidelines. Current versions are posted now or will soon appear here as noted below. You may download PDF versions or request printed versions at the email address included above. The 2019 Show Schedule in PDF format may soon be downloaded here. This document is a PDF letter size format with two pages side by side. The following downloads are addenda to the schedule showing rules for the various competitive divisions. The 2019 Horticultural Division Rules in PDF format may be downloaded here. The 2019 Artistic Design Rules in PDF format may be downloaded here. Only the 2019 Photo Rules in PDF format may be downloaded here. The 2018 Spring Newsletter, last year's, in PDF format may be downloaded here. Download three pages describing how to prepare for a show: Getting Ready. 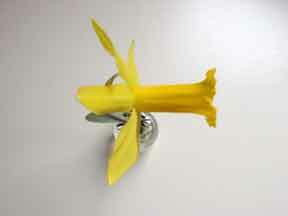 Download a one page overview of how to enter blooms: Showing Daffodils.. This contains a description of how to prepare an entry. Download an article describing how to refrigerate daffodils before a show: Refrigerator. Download a PDF copy of the Fall 2017 newsletter. This contains info for last year . Download a PDF copy of the Fall 2017 Bulb Sale for October . This year's Bulb Sale information will be posted in early October, 2019..
Download a PDF copy of the Fall 2017 Bulb Exchange list. Download a PDF copy of the schedule booklet for our show on April 27-28, 2019. This version is for printing 2 pages side by side. THe booklet format will be distributed at the show. See our Facebook page for more information and for many photos from from former MDS and American Daffodil Society shows. Visit the home page of : The American Daffodil Society. Many other daffodil shows and sources are referenced there. View or take part in the worldwide ongoing conversation about daffodils at Daffnet.org. You may go directly to Daffnet here. This website is intentionally kept to minimum, primarily local, information. See DaffodilUSA.org for much more information about daffodils.